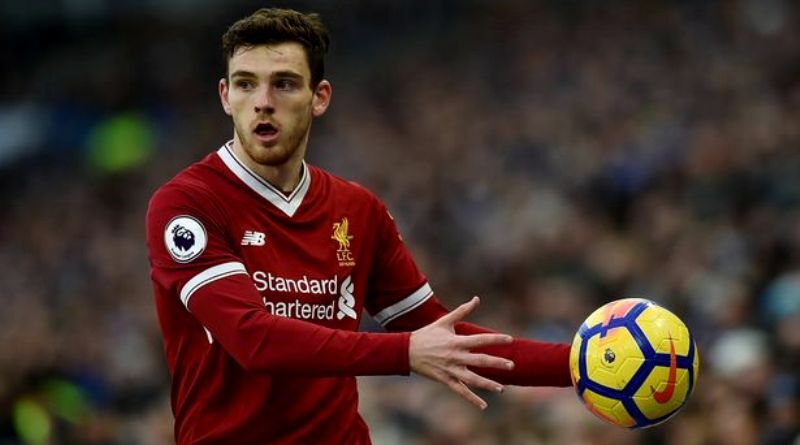 Andrew Robertson (born 11 March 1994) is a Scottish footballer who plays as a left back for Premier League club Liverpool and the Scotland national football team. Robertson began his senior career with Queen’s Park in 2012 before joining Dundee United a year later. His form in his first season as a professional led to him being named SPFA Young Player of the Year and also making his international debut. He joined Hull City in July 2014 for a fee of £2.85 million, before joining Liverpool in July 2017 for an undisclosed fee, believed to be an initial £8 million. Robertson was born in Glasgow. He attended St Ninian’s High School in Giffnock, East Renfrewshire, from 2006 to 2012, where he captained the football team. He also played for Giffnock Soccer Centre and joined Celtic as a youth, but was released at under-15 level because he was considered to be too small. He then signed for Queen’s Park. Robertson’s son, Rocco, was born on 26 August 2017. In March 2018, he donated a signed Liverpool shirt of his teammate Roberto Firmino to a young boy who had given his pocket money to a local foodbank. Focusing on his studies, he was on the brink of starting university at undergraduate degree level before he was called up to the Queen’s Park first team at the beginning of the 2012–13 season. He made his debut for the club in the Scottish Challenge Cup, in a penalty shoot out win against Berwick Rangers. He went on to make a total of forty appearances during the season, helping the club to a third-place finish in the Scottish Third Division. His first goal for the club came in a 2–1 defeat to East Stirlingshire on 13 November 2012. He signed for Scottish Premiership side Dundee United, along with Queen’s Park teammate Aidan Connolly, on 3 June 2013. Robertson immediately became part of manager Jackie McNamara’s first team plans, making his debut for the club on the opening day of the season in a 0–0 draw with Partick Thistle. On 22 September 2013, Robertson scored his first goal for Dundee United, in a 2–2 draw against Motherwell. He ran from his own half before sending a low left-foot drive in to the goal from 22 yards. Soon afterwards Robertson agreed a new contract with United, until May 2016. Robertson was voted SPFL young player of the month for September 2013 and player of the month for November 2013. On 12 April 2014, Robertson played in the Scottish Cup Semi-final against Rangers at Ibrox, which United won 3–1. In April 2014, Robertson won the PFA Scotland Young Player of the Year award and was also named in the PFA Scotland Team of the Year for the 2013–14 Scottish Premiership. In July 2014, Dundee United accepted an offer of £2.85 million for Robertson from English Premier League club Hull City. The transfer was completed on 29 July, as Robertson signed a three-year contract with Hull. Robertson made his competitive debut on the opening day of the season in a 1–0 victory away to QPR. Robertson quickly settled at Hull and established himself in the side, winning the club’s Player of the Month award for August 2014. His first goal for City came on 3 November 2015 away to Brentford where he opened the scoring in a 2–0 win to put Hull top of the table on goal difference. Robertson started the 2016 Championship Play-off Final against Sheffield Wednesday, which Hull won 1–0 to secure promotion to the Premier League. On 21 July 2017, he signed a long-term deal with Liverpool for an initial fee of £8 million. On 19 August, Robertson made his debut in a 1–0 win over Crystal Palace. Robertson started the 2017–18 season as understudy to Alberto Moreno, but got a run of games when the Spaniard was injured in December. His performance in the 4–3 victory against league leaders Manchester City on 14 January earned praise from the Liverpool supporters. Robertson scored his first goal for the club on the final match day of the 2017–18 season against Brighton in a 4–0 victory. He was first selected by the Scotland under-21 team in October 2013. Robertson made his debut as a substitute in a 2–1 win against Slovakia. Robertson was first named in the Scotland squad for a friendly against Poland on 5 March 2014. He came on as a substitute in the second half, as Scotland won 1–0 in Warsaw. Scotland manager Gordon Strachan said afterwards “Andy came on there and the first time he picked it up he drove about 30 yards. I thought ‘that’s fantastic’. Absolutely no grey area, I’m going to do what I do. I loved seeing that first touch.” Robertson made his first start for the national team in a 2–2 draw with Nigeria on 28 May 2014. He scored his first international goal in a friendly against England at Celtic Park in November 2014, scoring Scotland’s only goal as they were beaten 3–1. Robertson was selected for the under-21 team in November 2015, as the full national team did not have a fixture.